ZOO YEAR’S EVE – Bring in 2016 in a wild way and with a roar! Find yourself every year wondering what to do to bring in the New Year with your kids and still have the latter half of the evening for an adult celebration? ZOO YEAR’S EVE is the answer! ZOO YEAR’S EVE is the best party going with an urban jungle-style twist this year to keep the event fresh! A graffiti artist will be painting in the ENMAX Conservatory from 6 p.m. until 9 p.m. to create an amazing art piece on the theme of the night to eventually be commissioned back to the zoo. If skating is your thing, a live DJ will be on the rink for the evening taking song requests under the funky lights of the rink tent. On the live entertainment stage this year there will be two performances one at 7 p.m. and then second at 8:15 p.m. Some of the performances include urban jungle rap, freestyle dance, poetry, improv games and comedy sketches. Fun for the whole family! The highlight of the night is always the spectacular 12 minute animal friendly fireworks at 8 p.m. viewable from three different vantage points. Keep in mind that they are low impact/low noise that have been tested for animal safety and welfare. There are no animal buildings open during ZOO YEAR’S EVE in keeping with the protection of the animals’ health and well-being. Entertainment and fireworks are presented by GlobalFest. 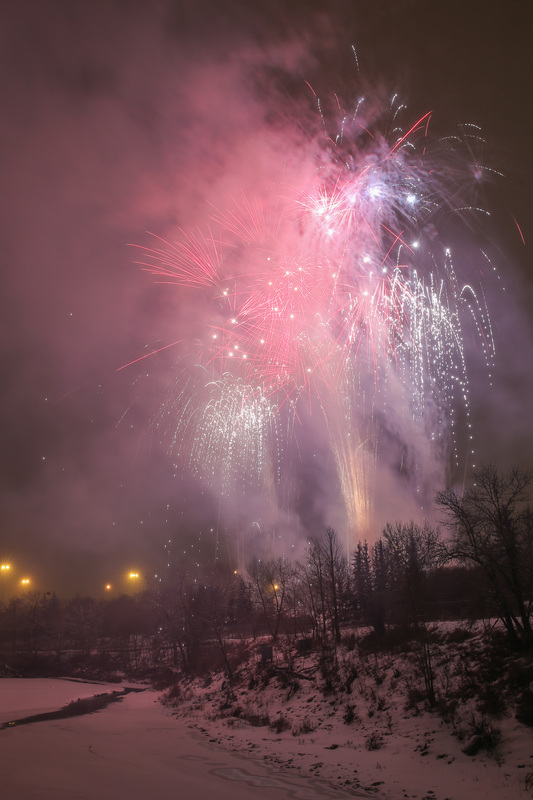 The Calgary Zoo is one of the only places in Calgary to have fireworks on New Years Eve. Of course the lights of ZOOLIGHTS are still a big part of the evening and you can gather around the cozy fire pits with a hot chocolate and your favorite folks. There is no better way to welcome in 2016! Tickets are available online for pre-purchase only or by calling the zoo at (403) 232-9300. The event runs from 6 p.m. to 9 p.m. (gates close at 8:30 p.m.) and there are a limited number of tickets available. Parking is $5 as of 4:30 p.m. but guests are encouraged to take the LRT as it is an environmentally friendly measure.